Last week was not as productive. We’ve been dealing with a master bathroom remodel (not all that intentional! ), so that has taken up a chunk of time. Also, my “day job” work has gone nuts and I have been very busy with that. Christine, I’m dying to hear more about your unintentional master bathroom remodel! Hi Miranda! I didn’t catch this comment til today! I’ll post some in-process pix of the bathroom soonish. It’s a mess. The master bathroom shower leaked into the ceiling of the living room and part of the ceiling fell. Yikes. So we’re (my husband is) ripping it ALL out and replacing everything. Picked out the tile already and will have the plumber and tile setter in soon to finish the job. Today I’m just back from a yoga teacher training in Burlington, Vt, and packing to leave for the Berkshires today. Creative plans- visit MassMOCA, do watercolors with the kids, and draw them all. I found a book on Alice Neel drawings in Burlington that reminded me how much I love to draw people. Make a card to thank the owner of the yoga studio who organized the training and who inspired my practice. Keep it simple. Sounds like you’ll be having a fabulous time in the Berkshires, Deborah! Looking forward to hearing more about your week away….was it hard to be away from the kids? Hugely inspiring? A mix of both? I’m in this REALLY hectic-feeling period where I can’t seem to balance work/mamahood/chores and I don’t get to ANYTHING I mean to. 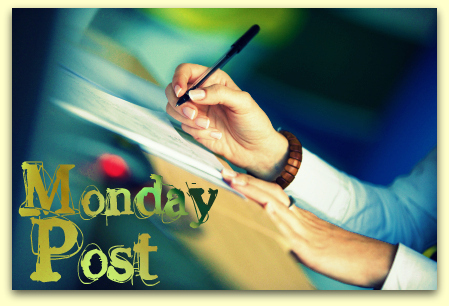 Like, I didn’t even manage to comment on last Monday’s post! Or respond to blog comments! GAH!!!!! If I could pick a key word for this week it would be PLAY. Nice, Meg. If you feel that specific goals are interfering with your focus on process (and enjoyment of same) then it’s definitely the right time to chassé over to a different approach. 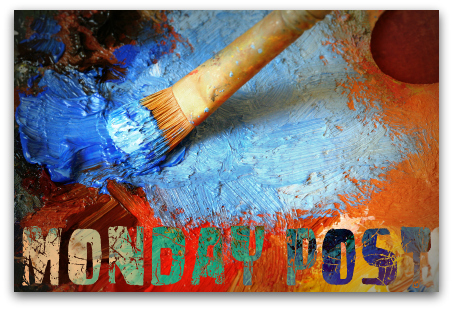 Focusing on “play” rather than enumerating specific goals is still an excellent source of intention, which is all that the Monday Post is meant to provide. Intention, presence, awareness. That second item on your list would make for an awesome blog post — will you let us know how it goes? last week, i tried to rush, and found out once again that that is not the most effective way for me to write. i got about the same amount of work done that i have been averaging per week for a while now, but with more stress. this week: decided to work at home today, doing a ‘once over’ of what i have so far, looking for any glaring repeats and other flaws and to catch me up to where i last left off in the manuscript – leading me to better work tomorrow. grandma took toots to the y this am, so it’s quiet, even with laundry and garden weeding calling. so far, not bad for a couple of hours work – about a quarter into the manuscript in the read through. i am just going to plug away as much as i can without trying so hard for the rest of the week, then it’s time to retrieve the boys and go camping again! readthrough, swimmingly good! i fixed a couple of continuity issues, etc, but mostly i found the manuscript to be much tighter now so far. i was going to hit the ground running toward the next chapter edits today, but i got sidelined with some concerning personal news today, so instead, i cleaned and cleaned. i couldn’t really sit still and concentrate. hopefully by tonight, i can calm down and do some edits after 9pm. but most of today was awash in stress and questions. thanks for listening! road of good intentions, you know…. Yay, Cathy! And if you’re still not ready to concentrate, try not to stress over it. The fallow times are crucially important. Stuff is percolating in the background while you’re cleaning — and will only strengthen your ultimate return to the ms. Right? yes, that is very true, miranda, something that i usually am good about recognizing – until i get myself into a tizzy! lol!